Sydney Evan's pieces reflect "timeless concepts of spirituality, sentiment, and personal expression," so it's not surprising Gwyneth Paltrow is a fan. 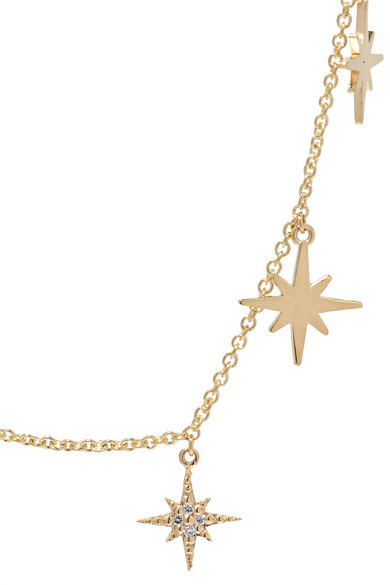 This 'Starburst' necklace is made from 14-karat gold and strung with five delicate charms - the central one is studded with brilliant-cut diamonds. It sits neatly upon your collarbone and can be adjusted to suit longer or shorter necklines. Shown here with: Jacquemus Blazer, James Perse Tank, Sydney Evan Bracelet, Sydney Evan Bracelet, Sydney Evan Necklace, Sydney Evan Earrings, Sydney Evan Bracelet.